One of my favorite trips when we visit the Big Island of Hawaii is the Volcanoes National Park. The park is absolutely spectacular, a first hand encounter with the the raw nature. It’s one of the top destinations for a great family vacation. If you are staying in Kona, which you most probably are, the drive to the Volcanoes National Park is pretty long, about 3.5 hours, but totally worth it. It’s a once-in-a-lifetime experience. 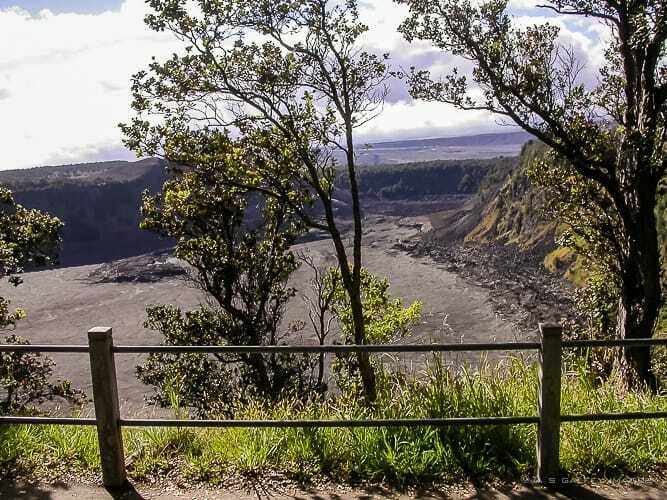 The park can be easily visited by car in just a couple of hours via the Crater Rim Drive, an 11 miles road that encircles the caldera and has access to several scenic stops and short walks. 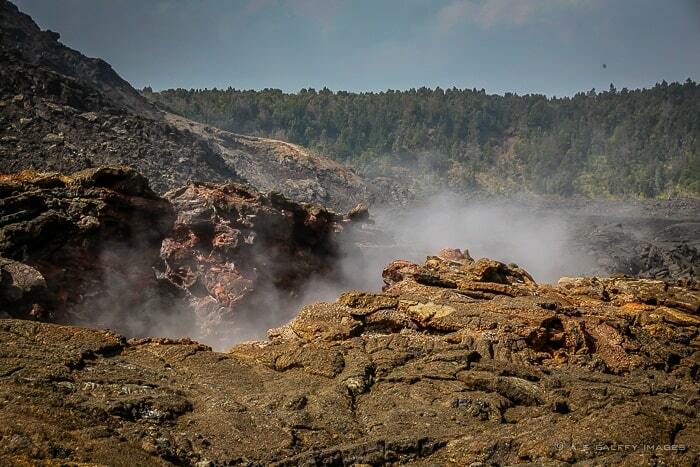 But if you can spend 3-4 hours in the area, I would recommend the very spectacular hike to the Kilauea Iki Crater. The hike begins at the Overlook, where you can actually see what you are about to experience. 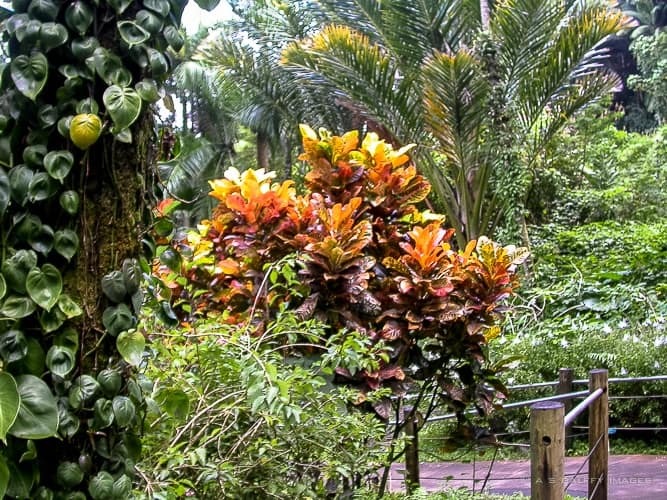 The trail goes through a gorgeous tropical forest and continues down 400 feet with a mixture of stairs and steep terrain.You walk through a canopy of trees and tropical plants, populated with insects and colorful birds. After reaching the crater, the trail continues for about one mile across the caldera floor, through a very scenic landscape of fumaroles, volcanic rock and volcanic vegetation. In the crater the air is very hot and dry, so you will need some sun protection, but the view is absolutely grandiose. 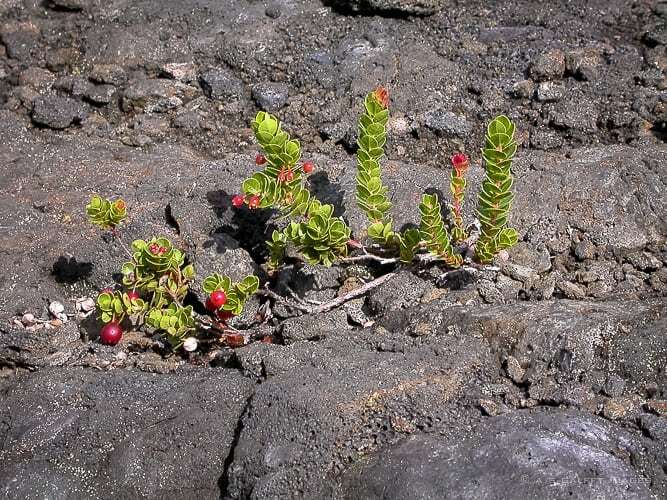 You would expect the crater to be an arid and barren area, but you will be amazed to see so many plants are living in the hardened, cracked lava. The hardest part of the trip is back to the top. 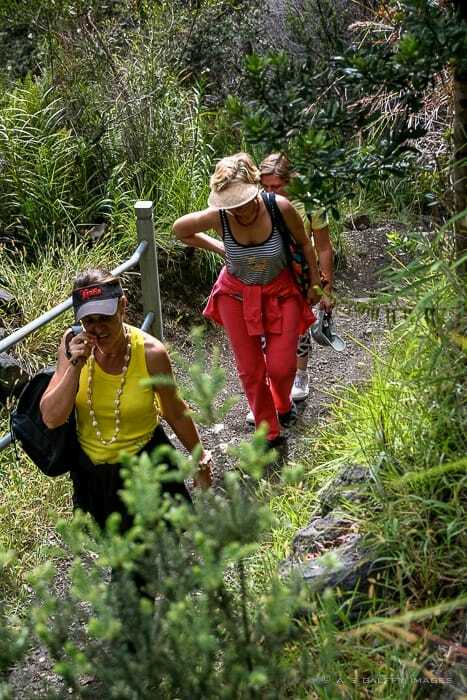 After the walk across the caldera, the ascent seems more difficult, although shaded by the tropical vegetation. Once you reach the top, you’ll have to continue walking around to reach your starting point, if you parked your car there. 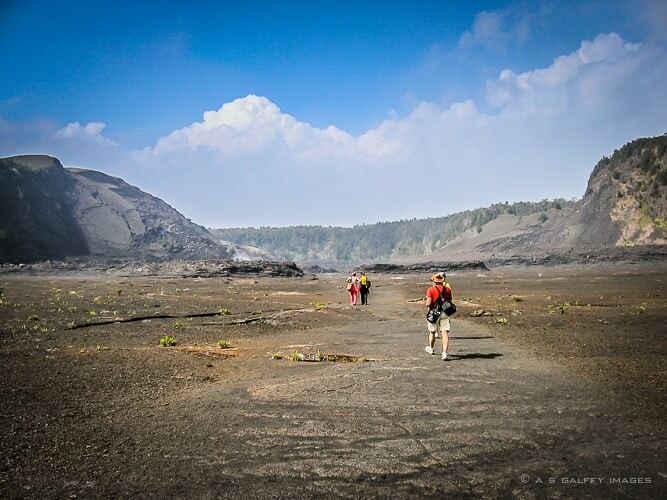 There are several other trails in the area, so if you like hiking the Volcanoes National Park is a real paradise. Most trails are well maintained and easy to follow. 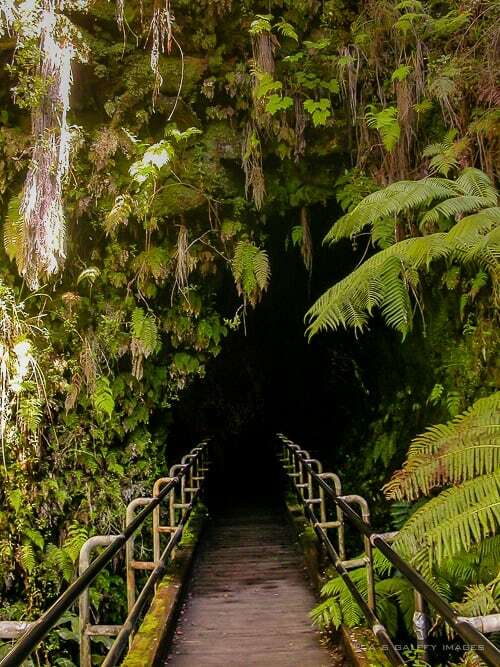 While you are in the Park you can also visit the Thurston Lava Tube – a real “journey to the center of the earth”. It is a short but very impressive hike. The Lava Tube was formed by the hot lava flow and looks very much like a cave. The first part is lit by electric lights and is high enough in the center to allow upright walking. But after this short corridor, there is another segment that is completely dark and has a very uneven floor. Tree roots are hanging down from the ceiling and water is dripping through the cracks forming small, slippery pods. This segment is very difficult to walk without a good flashlight. The entrance to the lava tube is surrounded by lush tropical vegetation and is close to the parking lot away from the Kilauea crater. At the other end of the tube there are stairs leading back to the surface. 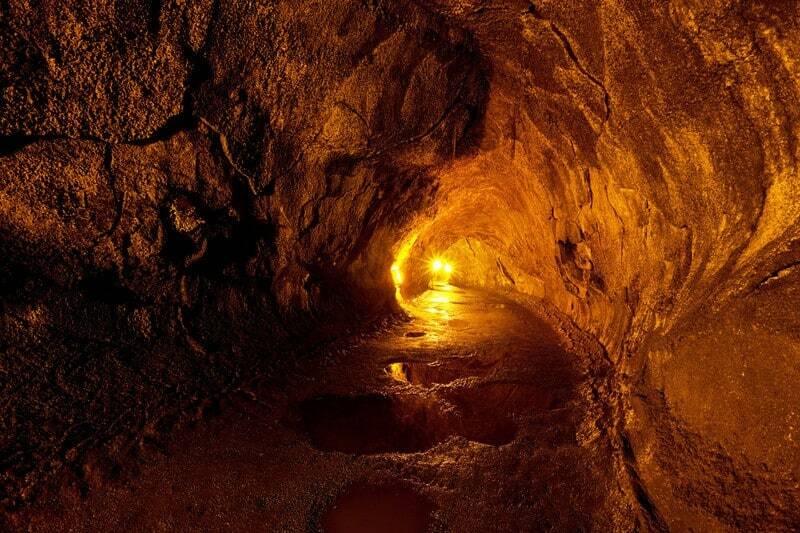 The Big Island has the longest and highest lava tubes in the world. You should credit the photographer by name instead of just "Canstock". I would if I knew who the photographer is. When you sell your pictures to Canstock Photo you loose your rights to them, so your name doesn't appear anywhere. Wow, what I see there? cooled and hardened lava? it really looks like you are walking on the surface of the Moon or on an alien planet. This looks amazing and is right up my alley! I'll definitely be doing this whenever I finally make it to Hawaii :) Thanks for linking up to the #SundayTRaveler! Thank you for your beautiful comments, Ashley. We didn't get to hike the crater when we were in Volcanoes NP. Too bad as your description and photos make it seem like a great hike. We did the Thurston Lava Tubes dark segment which was a big hit with the kids. Thank you for your comment. It's not a difficult hike if you are in a decent shape. Done both of these - twice! The crater hike is great although I'd recommend trying to see a different lava tube as this one is pretty sterile compared to those less touristed we visited. But this one is very accessible with stairs, rails, lights, etc. Wow, this looks like absolutely great hike. The vegetation is pretty. And I would really love to experience that journey to the center of the earth. Thurston Lava Tube is now on my bucket list. Wow that is so cool! Very lovely photos. I would love to go a "lava tube" - that sounds so cool. 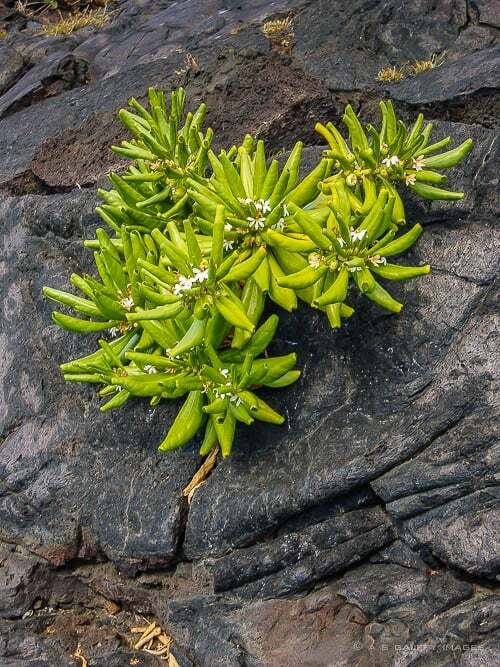 It's also really neat how plants are growing out of the cracked lava rocks!! Wow the lava tube looks amazing! The hike looks like it may get a bit difficult but I'm sure it was definitely worth it. Any hike in Hawaii is worth it! Beautiful pos and amazing pics. I really want to visit now! Thanks, Margherita, I appreciate your comment. Thanks, Rachael.It's very beautiful there. It seems to me you've seen way more beautiful craters, but Maui is worth a visit anyway. Thanks for your comment. Volcanoes, lava tubes...and beautiful photos...oh my! I would love to do this...but I have to admit everyone looks hot. Love your photos. Thank you, Corinne, for the nice comments. It is hot indeed, but not as bad as you might think, just around 84 F degrees.